It’s also simple. With a little prep work the day before, this simple recipe for shrimp pasta primavera can be on the table in under 30 minutes, and because it’s loaded with vegetables, a serving of Shrimp Pasta Primavera is all that you need for a well balanced dinner. Of course, Baker’s Man, Sue Chef, and Food Critic would strongly suggest that this be served with some cheesy garlic bread. Actually, this cheese and garlic crack bread is Sue Chef’s favorite. I suspect that this could be made in one pan, but I used two. Two pans for a delicious dinner of rich and creamy shrimp pasta primavera isn’t too much of a mess. We even add the vegetables and shrimp to the cooking pasta to make preparation easy. 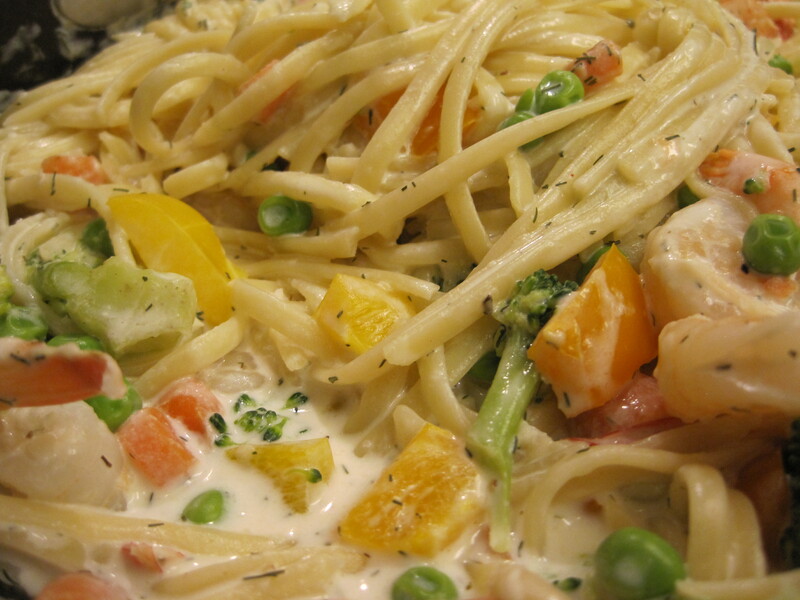 Give our recipe for Shrimp Pasta Primavera a try and let us know what you think by leaving a comment below. This is a simple and filling meal. Because the pasta is loaded with shrimp and vegetables, there's no need to supplement this meal with anything else. If you have a family of big eaters, you can serve it with garlic bread or a side salad. Cook's Note: I recommend that you add the salt last and taste the sauce before adding it. Parmesan cheese is fairly salty on its own. Also, to save some fat and calories, you can substitute and equal amount of plain Greek yogurt for the sour cream. Total Cost of Recipe = $12.16 or $2.03 per serving. Put water on to heat up before beginning to prep the vegetables. Cook Pasta in boiling water according to package directions, setting timer for 5 minutes before the end of cooking time. 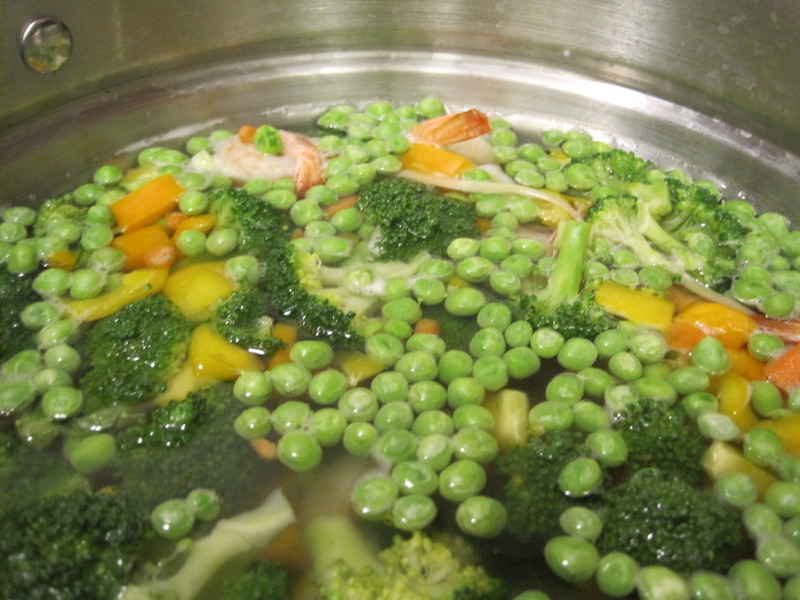 Five minutes before pasta is done, add broccoli and carrots to the pot with the pasta. Set timer for two minutes. After two minutes, add bell pepper, shrimp, and peas to pot with pasta. Set timer for three minutes. When the timer goes off, and the pasta is finished cooking, drain pasta, vegetables and shrimp and set aside. While the pasta is cooking, mix together half and half, sour cream, Parmesan cheese, granulated garlic, thyme, dill weed, and black pepper in a large, deep skillet that will also accommodate the pasta mixture. Mix well and bring to a boil, stirring constantly. Reduce heat and simmer for 3 to 5 minutes until all the flavors are well combined. Add drained pasta, vegetable, and shrimp mixture to sauce and toss well to combine. Nutrition information is for one-sixth of the recipe. This looks perfectly creamy. 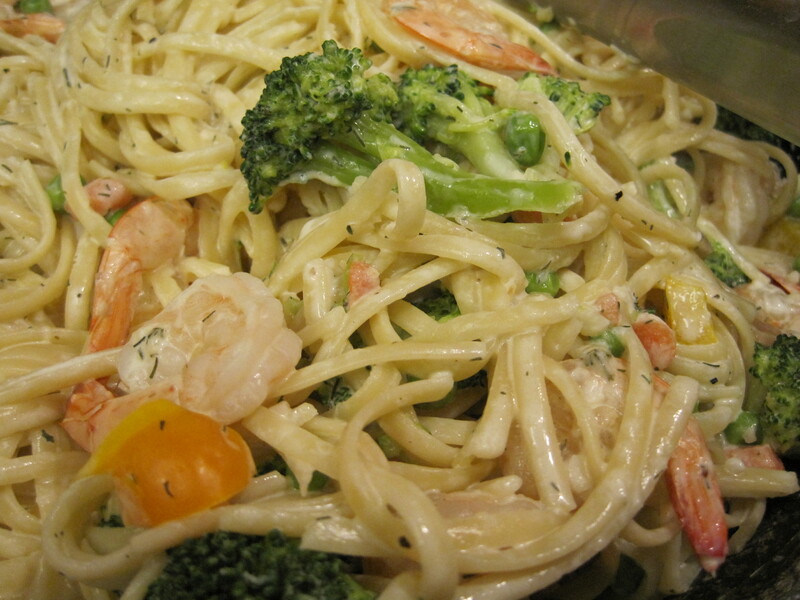 I love creamy pasta dishes with veggies and shrimp. Yuuum! It’s very creamy and quite delicious. Sue Chef loved it. Looks creamy and delicious, just the way it should! Nice job! Thank you. We love creamy. You’re welcome. We really enjoy sharing recipes that are both frugal and delicious. I think shrimp and pasta are perfect with each other. I can tell by the fresh ingredients this is going to be amazing, thank you for sharing your recipe! We love shrimp and pasta, together. Of course, we also love shrimp and rice. Oh…we love shrimp and veggies, too. I guess we just really love shrimp. I love that you can switch out the veggies based on what’s readily available and in season. I love all the flavors in this dish! The veggies sound so good with the creamy sauce! I was thinking that we could probably make this dish without the shrimp. (Don’t tell Baker’s Man I said that.) A vegetarian version of this dish would be just as good. We had pasta a lot growing up, so I think it’s because it was frugal and could feed a lot of people! This pasta dish looks so fabulous and delicious! Can’t wait to try it! It’s true that pasta is a frugal food. That’s one of the reasons that we like it. What kills me is when we go to a restaurant and pay more than the cost for this entire recipe for one plate of pasta. I love a great pasta dish. Shrimp and pasta is always a great pairing. This is perfect for an easy weekend meal….pour a glass of wine and enjoy!! We really enjoyed making this, and eating it. It would make the perfect meal for a lazy weekend. Great idea! This pasta primavera is a comfort food classic! So simple and delicious. Sharon, I completely agree with you. Pasta, of any kind, is a great comfort food. I tend to default to shrimp scampi when I pair shrimp with pasta, but this is a great idea! Love all those veggies in there. Ashley, I frequently default to shrimp on weeknights because it cooks quickly. I love shrimp scampi, too, but what I loved more was that my children ate all of the veggies in this pasta. That’s always a good thing. This looks delicious! So perfect for dinner. And I love shrimp! I know that if you make this, you’ll love it. The creamy sauce and pasta are perfect for dinner on these cold winter nights.